Most explanations of Dürer's well-known print focus on St. Jerome's biography, his translation of the Bible and his beliefs. Much can be learned this way but for the ordinary art lover, looking to gain some immediate insight, there are other simpler avenues that specialists have never imagined. 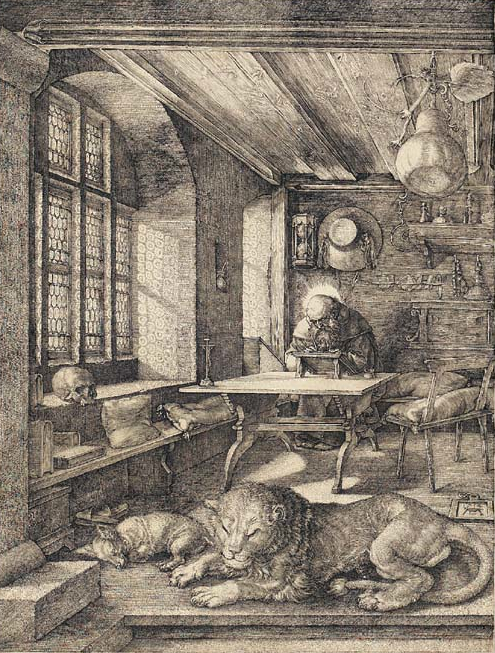 Take, for instance, Dürer's identification with the lion, Jerome's saintly attribute. I will not show how the entire image is based on a lion's head because the evidence is too subjective. Nevertheless other evidence of the artist's identification is more or less obvious. 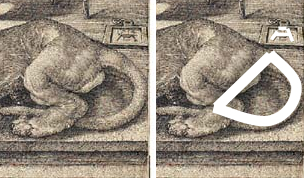 The artist's monogram, a small D nestled inside a large A, is smaller than usual resting on the floor above the lion's tail. It is so small that only the A is visible. 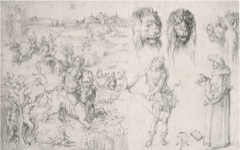 Underneath, though, the lion's tail spells out a giant D so that the two together read AD for Albrecht Dürer. Nor is that all. The lion sits patiently, his forelegs stretched out horizontally across the image, its sharp claws seeming to scratch the horizontal shading of the wooden floor like the artist's burin did on the woodblock. The lion is the artist making, in his own imagination, this very image.1 The saint, a small figure in the background, repeats the pose of the lion but facing us, his two forearms parallel in front of him. The studio of a thoughtful scholar has thus become a visual metaphor for the artist's own mind at one with nature, the only state from which a master can create a masterpiece. St. Francis, then dead for three centuries, would have understood. 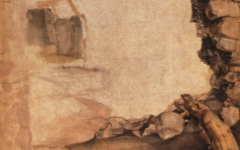 So stay alert for shapes that mimic the artist's initials and for forms that echo one another within the image. No arcane scholarship is needed for that, just knowledge of how an artist's mind generally works and some of art's more familiar methods. 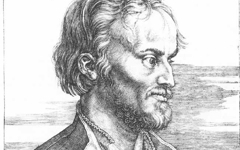 Examine some other prints by Dürer to give it a go. 1. See my post on "Great Engravers are Dogs" for a similar use of an animal with claws by the Master of the Amsterdam Cabinet a generation earlier. Original Publication Date on EPPH: 06 Jun 2011. © Simon Abrahams. Articles on this site are the copyright of Simon Abrahams. To use copyrighted material in print or other media for purposes beyond 'fair use', you must obtain permission from the copyright owner. Websites may link to this page without permission (please do) but may not reproduce the material on their own site without crediting Simon Abrahams and EPPH.